One of my fave photos from my lil sis who took this after our sho-buying spree when she was with me on holiday in July. My wee guy, totally amazed that his mum could buy such pretty things, was enthralled by the whole shoe bonanza and still refers to these as "your pretty, pretty shoes" in hushed tones of reverence. ..... and for my birthday I got a silversmithing course (thanks to DH for paying for it and to Ma for buying the tools)! I spent the weekend up to my armpits in solder and silver filings at Mountain Gems in Burnaby, under the watchful eye of Cori, our amazing and inspiring teacher for the 10 hours of the class (plus the extra panic time for extended pickling on Saturday evening and finishing the projects on Sunday evening - most appreciated and thankyou). In summary, definitely a birthday well spent! One of my main problems with selling on Etsy is the lack of customer service vis a vis ensuring site information delivery to users. As with the 'blood from a stone' analogy, it can take hours of forum watching and trawling to get hold of important updates, vital shop maintenance info and current SOP's. Since there are no 'sticky' admin threads I would literally be glued to the forums all day in my early Etsy career. Now, frequent attendance on forum might engender community spirit but in this user, who has witnessed some of the major customer service c*ck-ups on this site, it brings a warm fuzzy feeling of frustration as well as that niggling thought at the back of the mind that we might all be taking part in some huge social experience experiment (the "rat running on the wheel" image always pops into my mind whenever navigating thru Etsy now). I've seen frustration boil over and sellers meet their breaking points over inconsistency, rudeness, dismissal, off-handedness and authoritative silence. Situations which could have been defused handled the smooth, community, 'human' way, have escalated into storms above and beyond what need have happened. Now I see that some of this frustration is being channeled into services helping other sellers, namely Unofficial EtsyNews (UEN), EtsyTools and Etsy Shops. All are administrated by Etsy members and all provide the services which members feel are lacking on the parent site but none are officially sanctioned by it. Now instead of forum trawling for news I visit UEN for easily accessible updates, I visit EtsyTools to check out how listings and sales are moving over the last 24h, week and month, and then EtsyShops for the nitty-gritty on selling on Etsy. Voila! Time saved = inestimable, and a big thanks to the unassociated editors out there in lala off-Etsyland. I've finally taken the plunge and crocheted with sterling silver. For some reason working with this metal has been extremely off-putting but last night I couldn't resist the call from my wire drawer. Ever since seeing curbsidetreasure's treasury poster entry here I've been inspired into a white phase. So I cooked up a bead soup of white jasper, howlite, glass, shell and crystal and took it, a pack of fine gauge sterling wire and my trusty hook down to a girls' crafting night out. While three of the ladies knitted and the hostess embroidered, I knotted myself into 20 feet of sterling wire with beads attached. I then extricated myself, tumbled the resulting mesh and this morning it looks v purdy! Keep checking the flickr gallery for the completed cuff and here for on sale eventually! ... and so these are the complex earrings and (agree with me please cos I've had a long, hard day at a very quiet craft market without too many sales) they are more complicated in design than the simple ones I posted yesterday. 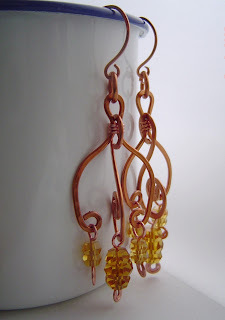 This pair is in hammered copper wire with vintage glass dangles. I made a similar pair for myself as my Christmas "party" pair (and how many parties does a SAHM mum of a four year old go to? hmmm) along with an asymmetric cleavage dangler in copper (for my asymmetric cleavage, since you ask!) similar to this mermaid necklace in silver. Whenever I wore the earrings they were commented on and complimented (nope, it wasn't always with the cleavage) so it's taken a good eight months to stop being soooooo dense and re-make a popular design. Is it just me or do others hate repeating designs? BTW, the earwires are my new hammered copper earhooks - now that I have copper earwires at hand there will be no stopping the copper ear adornments I can conjure up! 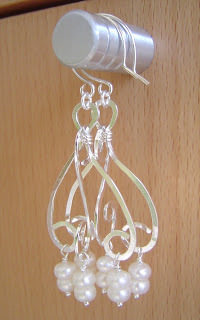 ... and this is the latest version of complex in hammered square sterling wire with freshwater pearl dangles. They are hanging from a version of my new tiny hoops sterling earwires (still playing around with the design of these ones). The hammered pieces were assmebled and then tumble polished for a few hours before attaching the pearls. The metal is thus polished shiney but not glossy and still retains some of the hammer marks. Interested? Available here on mintd. ... and I'll be making some more copper complex designs as the pair above are destined for someone special! 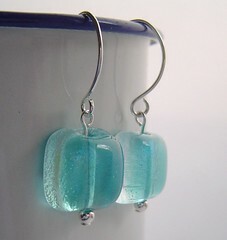 ...... and in the middle of this wiring sea glass frenzy I've made some time to make a few pairs of earrings. There are two styles now to choose from, simple (as shown in the pic) and complex. I'm not a great one for coming up with fancy shmancy, arty farty names for my jewelry pieces (from a scientist huh?) so simple and complex are here to stay. Simple is well, um .... simple. This pair comprises a pair of gorgeous luminous cabs from thecraftykind.etsy.com plus sterling silver beads on my new design sterling hook earwires. I've been wearing my pair every day since the beginning of the week. ... and complex is er (shuffles) complex (ahem). I'll post a pic soon or check out this link for a peek. 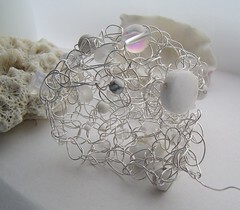 The pair in the link are made from hammered square sterling wire with dangling freshwater pearls. I've also been hammering up a pair in copper and vintage glass too (but not hammering the glass obviously). Mouth watering? then head on over here to buy them before they get snapped up at the market this weekend! There's something quite powerful about sea glass. I don't know if it's an emotional pull since all my pieces come from the scottish beach where I grew up or were collected by me from the wild, stormy beaches of Northumberland near where I bought my first house. Or maybe the knowledge that the glass had a former life and has been reborn, or the immense power of the ocean in which it changed ........ I'm not much of a poet or writer so I'll stop now but sea glass has always intrigued me. One of the local craft shops also holds a great deal of power over me too. Those little money off discount coupons which arrive mysteriously with every delivery of the local newspapers seduce me with promises of craftiness and new skills, so much potential contained in a four-page vivid advertising flyer. Anyways, the coupon is usually frittered away on findings, crayons for the wee guy, beading wire, preemo (used to be fimo but I've gotten a bit peeved at its rock solid condition recently and committed pc adultery) etc. etc. etc., all fairly low ticket value items - until January this year when I got a stamping set at 50% reduction! That was so totally worth it! At last - a meaningful purchase. "But that was January," ........ "This is August!" But back to the sea glass (at last). I stamped and tumble polished the disc and was quite pleased .......... but it seemed a little bland. Hmmm. 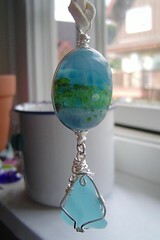 Add the wired sea glass and Voila! 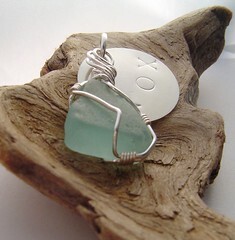 I give you Hugs and Kisses sterling and seaglass pendant. At last, the Shoozles cab is paired with the sea glass. It was well worth the aching fingers. Now listed in mintd for sale. I'm still trying to work out how I can craft in, around and in spite of my family so very often I end up making jewelry into the night. Last night was one of them! I'm currently on a wire wrapping binge and my poor little fingers are aching. I'm also losing my fingernails and am still working in plated wire or brass, copper, etc. cos I consider myself still learning. On the in tray beneath my hand you can see two blue blobs. The one on the right is one of the Shoozles cabs* I received a few weeks ago and the blue on the left is a piece of sea glass which matches beautifully. 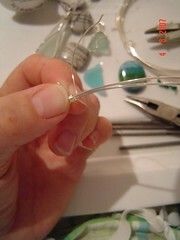 In my hand is the wire prep for wiring the sea glass. Eventually, sometime just after 11pm I finished wiring both peices. 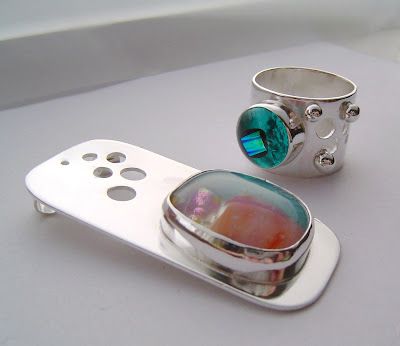 The sea glass is now in the tumbler, polishing and hardening. I'll post pics of the finished product which is destined for listing on Mintd. *I love this cab! Apart from it being a gorgeous collection of blues and greens, it also contains sand which was the initial starting material for making glass in days of yore!! OK so here are all my pics that have made it into explore on flickr since i set up my account. There are three jewelry pics, one embroidery (and I wondered why it got a lot of hits!) and my self portrait in a bubble. Am now having to stop my self checking my profile header every few minutes! 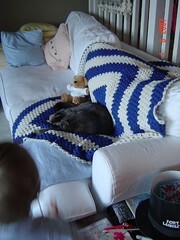 My mystery afghan from Fabiola arrived a couple of days ago. I picked it up from the PO yesterday, scuttled home with my parcel and wow! The colours are so great for my living room's summer theme (yes, I change it up with the seasons! winter is darker and more snuggly). It has a new home on the sofa and a new fan - Grizzy!